It’s hard to believe that summer is almost over! But the good news is that as the students go back to school, you can get in the spirit with some non-profit ‘learnin’! We’ve found 24 free non-profit webinars scheduled for September, including: a guide to non-profit video; sessions to get you ready for Giving Tuesday; tips for engaging family volunteers; help finding government contracts and grants; and “silent auction secrets”. Family volunteering inspires all members of a family to use their skills, time, and passions to help make the world a better place. While many organizations regularly welcome families as members, visitors, and clients, rarely do those organizations welcome families as volunteers. Research shows that engaging families as volunteers not only helps to address today’s needs, but it actively builds for the future, helping to nurture tomorrow’s volunteers and leaders. Join Beth Steinhorn to explore what family volunteering is, hear case studies of successful models for engaging family volunteers, understand the benefits of family volunteering, and receive tips on how to determine whether family volunteering is right for your organization. Founded in 2012, Giving Tuesday is a global day dedicated to giving back. Last year more than 10,000 organizations worldwide participated in Giving Tuesday. 2014 promises to be even bigger. Do you provide services that the government would like to contract for? If you help people with special needs, with housing, with domestic violence prevention, or other services, you may be eligible for government grants and contracts. Could you use an extra $100,000 or $1,000,000 to help even more people? If so, check out this Wild Woman Fundraising webinar. Carroll Bernard, former procurement officer for the US government, and government contracting specialist with GCAP and PTAC, the Government Contract Assistance Program, will be happy to help you learn how to quickly and easily find government contracts and grants that your nonprofit can apply for. Carroll Bernard's tips have helped hundreds of businesses and nonprofits find new government contracts. #GivingTuesday has rapidly become one of the most successful days for appealing to your donor base for end-of-year giving. As we move closer to the final quarter of the calendar year, when most donations roll in to nonprofits and support balloons for causes of all shapes and sizes, make sure your organization is ready! Join Melissa Cronin from 92Y, which created the GivingTuesday phenomenon, and social media wizard Wendy Harman of the American Red Cross to help get your strategy planning in order to maximize the most generous time of the year for your cause. How much money do you get a year with mailings? Would you like to double or even triple that? How can you write a more effective appeal letter? This Wild Woman Fundraising webinar will show you how to make your mailing plan, segment your mailing list into different types of donors, get deals on your mailing costs and more! Video is the most powerful communications tool in the 21st Century. During this CharityHowTo webinar you'll learn ways to turn video into visual storytelling so that it can work for your nonprofit to raise funds, build community, recruit volunteers, and incite action. You'll gain practical skills for creating video yourself and also understand what's involved in working with a professional video production company. Is your organization receiving more online donations? Are you providing outstanding stewardship to your online donors? If you answered no, then there's a good chance that you might be losing donors. When you take great care of your donors by showing them gratitude and impact, you raise more money and increase your donor retention rate. But all too often online donors are neglected in the stewardship process. During this 4Good webinar, you'll learn the 5 fundamentals of creating an online donor stewardship plan that helps you keep your donors as well as fun, memorable ideas for donor stewardship that will help your non-profit stand out. Here’s the good news. Even if you don’t change your items OR your audience, you can still raise more money. You just need to use the same marketing and psychological tactics in your silent auction that the big stores use to get us consumers to buy. In this 4Good webinar, you’ll see examples of good (and bad) silent auctions in action so you know how to get top bids at your event. If you’re thinking about starting a monthly giving program, this CharityHowTo webinar is for you! Join us to learn the fundamentals needed to start a Monthly Giving program, so you can benefit from the tremendous opportunities it can offer your organization. Now, more than ever before, volunteer engagement leaders have an opportunity to be champions of talent management. This JFFixler Group webinar will explore how volunteerism is changing, delving into the social, economic, and generational trends that affect how organizations attract and sustain volunteer engagement. Learn how successful organizations are shifting from a traditional culture of volunteer management to a new culture of volunteer engagement. Explore how to move toward more collaborative working relationships that utilize the skills and interests of high-impact volunteers to build organizational capacity. All nonprofits are supposed to avoid conflicts of interest. Avoiding such conflicts is a critical aspect of any organization’s nonprofit governance. It is so important that the IRS has placed a special emphasis on ensuring that tax-exempt organizations deal properly with this issue. Nonprofits are strongly encouraged to adopt a conflict of interest policy, and to take steps to make certain that the policy is properly implemented. In addition, the IRS wants organizations to follow special rules for setting executive compensation in order to ensure that no conflict of interest is involved. This DC Bar Pro Bono Program webinar will discuss what the IRS wants to see in an effective conflict of interest policy. It will also discuss who should be covered by the policy; what steps an organization should take when dealing with a potential conflict; and how to determine executive compensation in a manner that complies with the IRS safe harbor. This webinar is designed for members of the Board of Directors, executive directors, administrative officers, and other people wanting to gain knowledge about best practices in nonprofit governance. According to Blackbaud, most money is raised in the last quarter of the year. Around the holidays, people tend to give more, both online and offline. This means that your year-end appeal letter is a critical element of your fundraising success. How can you take advantage of this most wonderful time of the year? Even if you've written an appeal letter or two before, why not get some new tactics to raise even more this December? What are the different kinds of stories, and how can you tell them for your cause? What are appropriate fundraising pictures for your letter? How can you make your mission URGENT for your donors? What formatting mistakes do people often make with their appeals? How can you avoid them? How to talk about your nonprofit's accomplishments in a donor-centered way. Learn how to build relationships with foundation prospects and prepare for calls and meetings with funders. From initial contact to getting funded, following field-tested best practices will increase your chances of getting the grant. 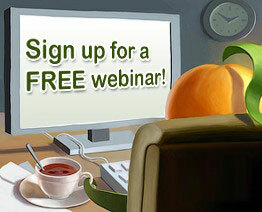 If your organization offers a free webinar that would be of interest to non-profit, membership or volunteer-based organizations and you want to include it in next month's post, please email a brief overview (like those above) to lori@wildapricot.com no later than September 18.